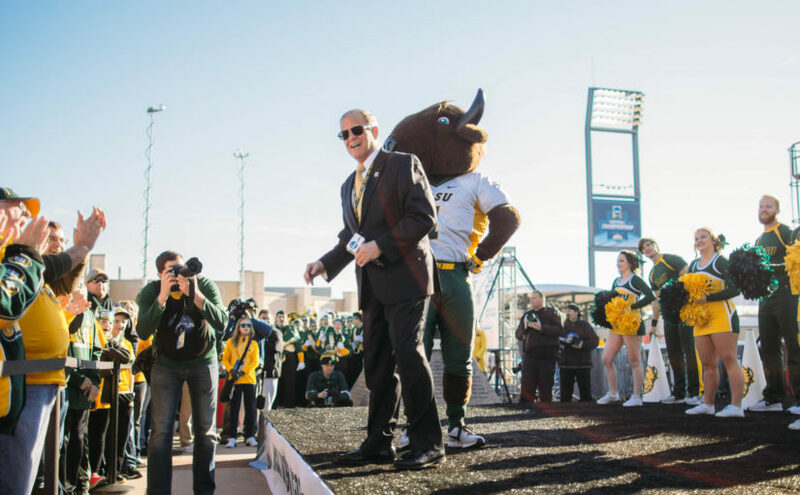 This past week, President Dean Bresciani announced that the official alma mater of our beloved university will be changing for what he says is for the better. If you’ve been to any of our school’s sporting events, especially to one of our precious football team’s rousing contests at the Fargodome, you have most likely been subjected to the hype-inducing walkouts featuring AC/DC’s ‘Thunderstruck’. This song is better known as the beat of the hearts of every bison. To remind students and faculty of the pride in which we hold for our alma mater, “Thunderstruck” will ring from the bells on the hour, every hour from the bell tower on campus. We ended the interview there at the mention of the “bells” on campus. And to be honest, how many people actually know the lyrics to “The Yellow and The Green”? I certainly don’t. President Bresciani certainly doesn’t, although he wouldn’t admit it when asked. Though he did tell me that “Thunderstruck” has been his ringback tone since 2009. This change has been approved and will take place in the upcoming academic year.